Many Emerging Food Brands we talked to since our first conference have been outgrowing their commercial kitchens and are trying to decide between expanding their operations or moving to a contract manufacturer or co-packer. Obviously, both routes come with risk. Mike Albregts: Owner at Pinhook Foods LLC, is a food industry consultant, and Purdue Alum. Formerly with Kraft. 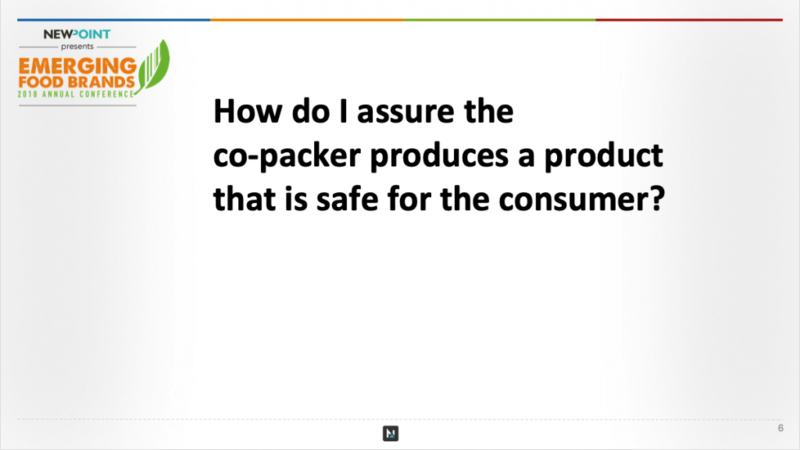 Vetting a Co-Packer Safety, Volumes, & Logistics Question #5: How do I assure the co-packer produces a product that is safe for the consumer? Erik Kurdelak: There’s a lot going on in this question. You are going to have responsibility for your product, and you’re going to define your process parameters. You’re going to say, okay, what’s my process design? What are my critical temperatures? What are my target organisms? What unit operations am I going to use to make sure that I’ve eradicated any microbiological threats? There’s a level of responsibility there, but in the same token, the co-packer is not going to look at that process and execute it if they know that it’s not adequate. There are process authorities that can review a particularly thermal process and make sure that we’re on the right track. When you think about your product and your hazard analysis, you look at every single ingredient. What are the intrinsic, inherent risks in that ingredient, and which, out of all the ingredients, is the most severe risk to human health? That becomes your target organism. If you’ve set up your process, and it’s set up on the wrong target organism, well guess what, you can have a lot of problems. 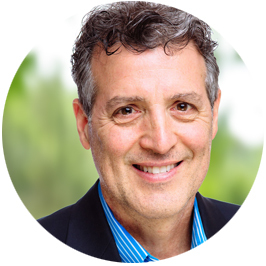 Chris Nutly (President of MSW Packaging): I just wanted to add that, mainly for ingredient safety, like wouldn’t you rely on third-party auditors to make sure that the food safety programs are in place? If it’s a company that has made products for different customers, then I would definitely leverage on their third-party audits, if they are GFSI certified. Erik Kurdelak: Absolutely. So looking at their certifications, their inspection records, who was conducting the inspections? You really have to understand the level of credibility that any given co-packer brings to the table. Why should you trust them with your product? Then making sure that you can have those open conversations, saying, “This is my process flow diagram. This is the target organism I had in mind. This is my process authority that signed off on this. What’s your feedback?” Making sure that everyone’s on the same page before you throw that big switch and turn the system on. Mike Albregts: Yeah, when the speaker was touching on GFSI certifications, there’s SQF, there’s BRC, there’s 22000, there’s AIB. There are all these different organizations. I will tell you this: I’ve been involved with some of those, and they’re fine, but what I don’t like is that it is a snapshot in time of that business. When they walk in there, they look at that business. Most of the time they get an advanced directive that they’re coming, so they clean it up. Mike Albregts: Bernie Liska, who was my counselor here at Purdue when I was in the Food Science Department—he told me, he said, “Mike, any time you walk in a food plant the first place you need to look is up, because everything comes down.” He talked about a jelly manufacturer who was having huge mold problems and he said all he did was look up and there was mold all over the ceiling. Every time they were putting the jar on top of the jelly the mold spores were falling all over the tables and everything else, contaminating the product. So, every time I walk into a food plant for the first time, I look up and see what the ceiling looks like. John Wisler: Just to add on that, some of the co-packers will have it, some won’t, but if they have it … look at their air handling system in the plant. The key is make-up air … that’s what’s in that plant. If that goes through a HEPA system, you’re going to have assurances and questions … So, if they do have one, ask, “Okay, how do you maintain this HEPA system?” Because the key is, if it doesn’t get in, it can’t get into your product. Mike Albregts: You guys talk about control, and I can tell you this: One of my packers, which is a spice company, does organic and non-organic products. The organic people want their stuff separated from everything else, but the main reason they separate everything from the organic, from the normal spices that are steam treated or through some other kind of treatment process to reduce pathogens, is because the organic stuff is not very clean. That’s because it did not go through a process. So, that’s like when you try to make an organic sausage with organic spices and seasonings, they’ve not been steam cleaned. They’ve not been sanitizing in any way, so your shelf life goes from 15 days to two. Erik Kurdelak: That goes back to your hazard analysis, and understanding what is the expected microbiological load off every single ingredient. If you’ve changed to organic chia seed, guess what? You’re baseline just shifted—a lot. Chia seed carries a lot of microbiological load. That will disrupt your process. So when I talk about a process authority, these folks are well-schooled. They’re very much experts in making sure that the process, as defined by the producer, is sufficient for the level of risk. So there are about 480 process authorities in the country, and a lot of them work in companies, and they’re not sharing. There are some that are independent that will work on projects and you can pay them as consultants. At Purdue University, we do have a process authority in our Food Science Department, Dr. Mishra, and he does a lot of extension work. He’s 80% extension. So he might be able to work with you. He’ll be at the Purdue Food Science table today. Mike Albregts: Yes, to add acid to lower the PH, basically so you can manufacture it and it still is shelf stable and non-refrigerated. So, that’s what John’s talking about. 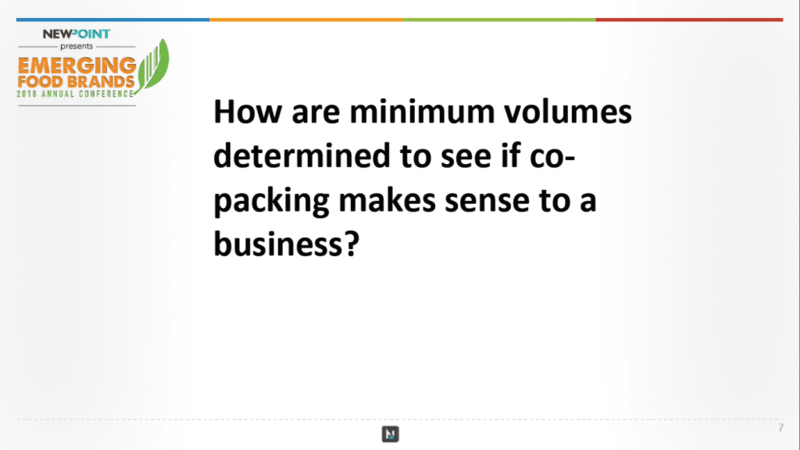 Vetting a Co-Packer Safety, Volumes & Logistics Question #6: How are minimum volumes determined to see if co-packing makes sense to a business? Erik Kurdelak: How are the minimum volumes determined? How do you know if it makes sense to a business? Really it comes down to three things: First, what’s your existing production capacity? How much can you produce in your existing system? Second, what are your open orders? And third, how much shelf life are you willing to sacrifice? You can’t make it all in one day, okay, well I can make it all in the span of a week, but, guess what? Monday’s product just lost shelf life. We’ve got to think in terms of shelf life, distribution, protecting our product integrity as it goes into the retail chain, or into the distribution channels. Those are really the big three factors to determine if this is the right course for your current business client. John Wisler: In terms of mound material too, things that you might say, “I’m tired of making this stuff every day. I’m going to go to a co-packer, and I want him to make it once a month,” or once a week, or whatever. Keep in mind there … might be a benefit of doing that in one sense, but another would be, “Well, now I’ve got to store it someplace. I’ve got to pay for it. I’ve got to sell for it.” Let’s say, “Okay, my shelf life at this temperature is six months. My shelf life at this temperature is a year.” Okay, where’s the trade-off? I might want to pay for air-conditioned storage. You need to look at all the variables associated with the decision you’re making. Erik Kurdelak: There’s an opportunity cost. If you were to move into a situation where you’re producing product two days out of the month, guess what? The rest of the month you’re building sales. That’s a good thing. You’re drumming up business, you’re getting your brand out there. If you can commit more of your waking hours to generate that next sale and less of it to actually manufacturing the product, that could be a real benefit in some cases, but it does come with a cost. Storage costs, shelf life concerns, and the like. Mike Albregts: You could always ask your co-packer, too, because, like the products I buy, most of them are based on a tiered pricing … if it’s a full truckload or three truckloads, or half a truckload. So, if you bought four pallets, maybe you could work a deal where they can run four pallets, or five or six, or eight, or whatever your usage is. You can still get rid of that product before it goes out of code date if it has an expiration date on it. Maybe they can put it on the shelf for you, and you can pay for part of it up front, and then pay for part of it as you pull it, if the manufacturer has the resources. You may be better off if they can store it for you, buy it all at the same time, and then pick it up as you need it. 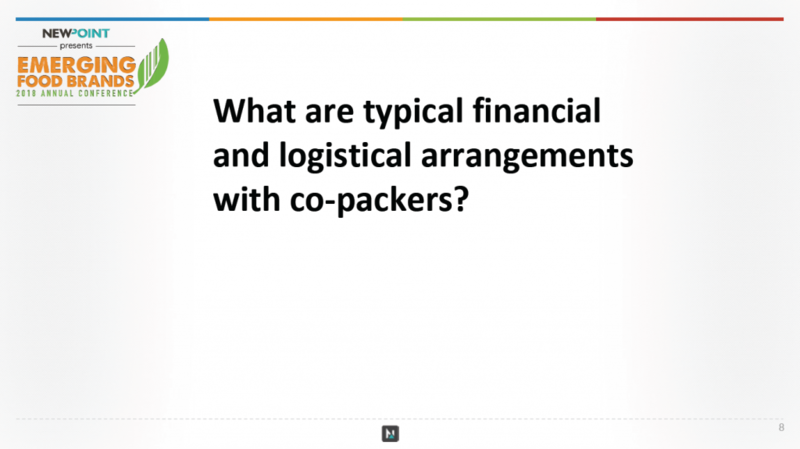 Vetting a Co-Packer Safety, Volumes & Logistics Question #7: What are typical financial and logistical arrangements with co-packers? Erik Kurdelak: Even in very small test runs that we would do in a Pilot plant, let’s say someone’s going to do 600 gallons of a product or something like that. I make it very clear with the outside users of our facility that you are going to be responsible for your own ingredients, for your own shipping, for your own containers. These types of things are not a cost that I can carry, right? So, we have to make sure that people understand that you’ve got to bear the brunt of those costs on the front end. Erik Kurdelak: So, in terms of the nuts and bolts purchasing, those are things to consider. Other things would be logistics planning, NDA’s, any kind of non-disclosure agreement, or confidentiality statements. Any kinds of contracts that want to be established to protect if you have a proprietary process, a proprietary ingredient, things like that. You want to make sure that you are defending your brand on the front end instead of getting it out there and then having to fight off copycats. Mike Albregts: A NDA disclosure just means that it’s something you divulge to them while you’re in the meeting. If the co-packer could buy your product off the shelf and look at it and see it has salt, pepper, whatever, in it, then that’s public knowledge. They could find that at any time. But, if you’re giving them a specific way to process or a specific ingredient that you could bury in there and call it natural flavors, or you don’t have to tell anybody exactly what it is, that’s what gives you the pop for your sauce, so to speak. That’s something you need to have a non-disclosure agreement with. Erik Kurdelak: Another real financial consideration is going to be paying these co-manufacturers for changeovers, from minimum runs, from clean-up. It’s not free to design a process for you to run on somebody’s line. They’ve got to justify not running everything else in the hopper. So, they’re going to charge you for the change over. They charge you for the run. They’re going to charge you for the clean-up, and that minimum run, if it’s 90,000 units, or if it’s 10 pallets, or whatever it is, I mean you’ve got to be ready to have those real conversations with them. Chris Nutly (President of MSW Packaging): About the last three questions, personally, in my gut, I’m saying to myself, that’s a relationship question. 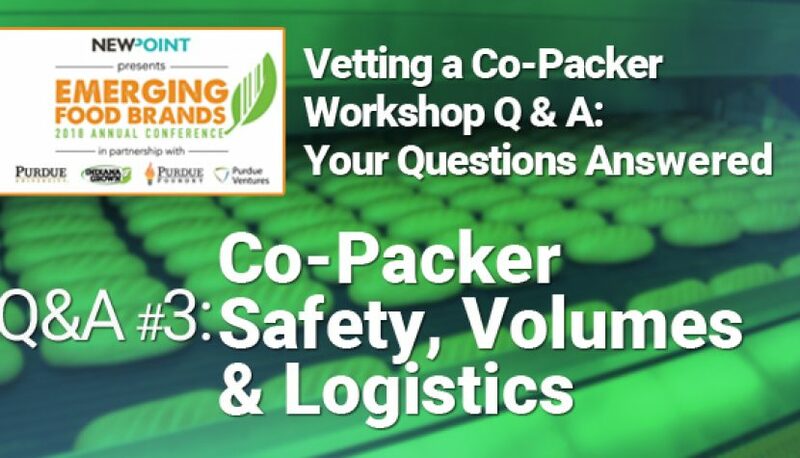 The relationship that you have with a co-packer, and the relationship the co-packer has with you has a lot to do with answering those questions. It’s key to have an open dialogue. In fact, about non-disclosure agreements, I have a non-disclosure agreement with every customer that we package for. They are bi-lateral non-disclosures. John Wisler: That’s somewhat common too. A lot of times that’s a question. If you don’t have a HACCP, you ask them, “I need you to put this thing together,” because you want that safety built into your product. Because that has liability associated with it, and you don’t want the liability. Mike Albregts: You might have to be named as additional insured as well … An additional insured on their insurance policy, if they’ll do that for you. If they’re packing it underneath your name, you may be able to get that done. This is the 3rd in our series of “Vetting a Co-Packer” posts. We have one more to come so check back!